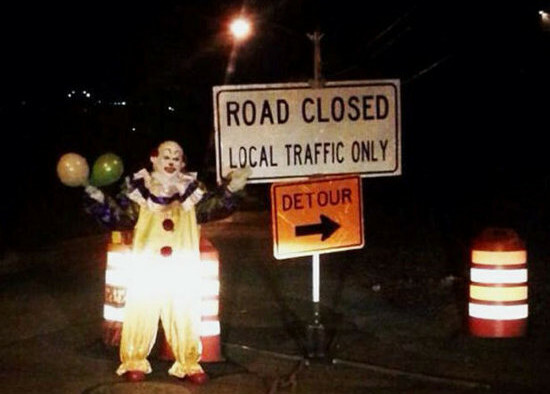 This Clown Is Terrifying Staten Islanders! A few weeks back, we brought you a sad story about the dangerous clown shortage that’s threatening America. But up in Staten Island, one clown is one clown too many. Pictured here is the horrifying clown that recently appeared in the area. No one knows why he’s there, and so far, all he’s done is hand out balloons to people. But most residents just want him to go away, as he’s frightening everyone. Many of the locals have taken to Twitter to voice their fears and frustration over the mysterious jester. My heart aches for everyone currently living in Staten Island, though something tells me Tim Curry would be proud. Post your thoughts below. But please don’t clown around…this is serious business.